This one-pan bruschetta salmon and asparagus is so simple to make, it’s ready from start to finish in less than 30 mins, yet full of flavor! I don’t know about you… but I’m all about quick and easy dinners! Yet, I’m not willing to sacrifice nutrition or flavor for convenience. 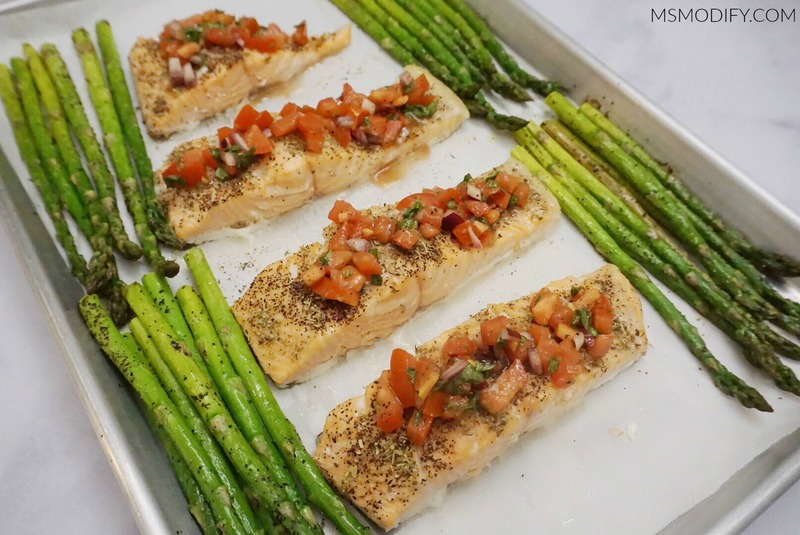 With that being said… I’d like to introduce you to one of my favorite dinners to make…one-pan bruschetta salmon and asparagus! Oh bruschetta, how I love you! I can literally eat bruschetta out of the bowl. No need to put it on anything for me! I also love how it’s a great flavorful addition to so many things.. and on fish is no exception! In our house, whoever cooks doesn’t have to do the dishes. Since I’m typically the cook around here, that means my sweet hubby is often on dish duty (don’t worry, I keep him company and dry for him!). So you can imagine just how much he loves these one-pan dinners! Make bruschetta topping by combining tomatoes, red onion, basil, olive oil, vinegar, salt, pepper and garlic powder in a bowl and mix together. Set aside and let marinate. 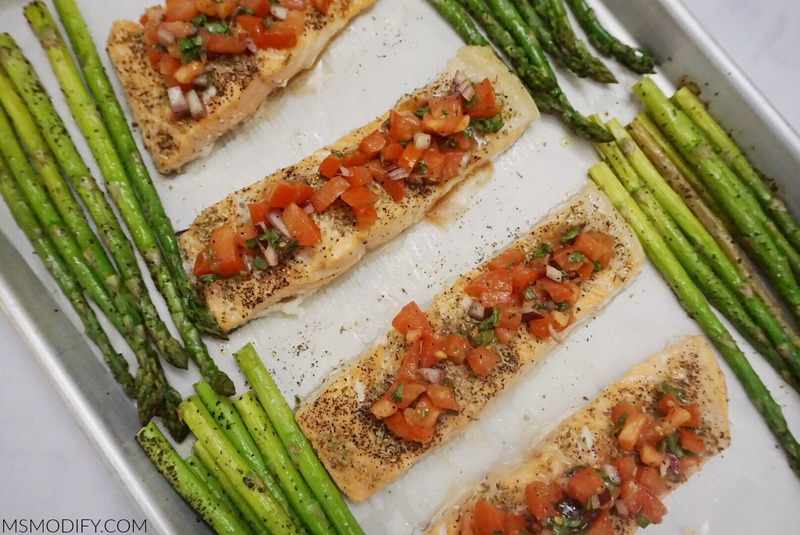 Place salmon in the middle of the pan, skin side down, and sprinkle salt, pepper and oregano onto fillets. 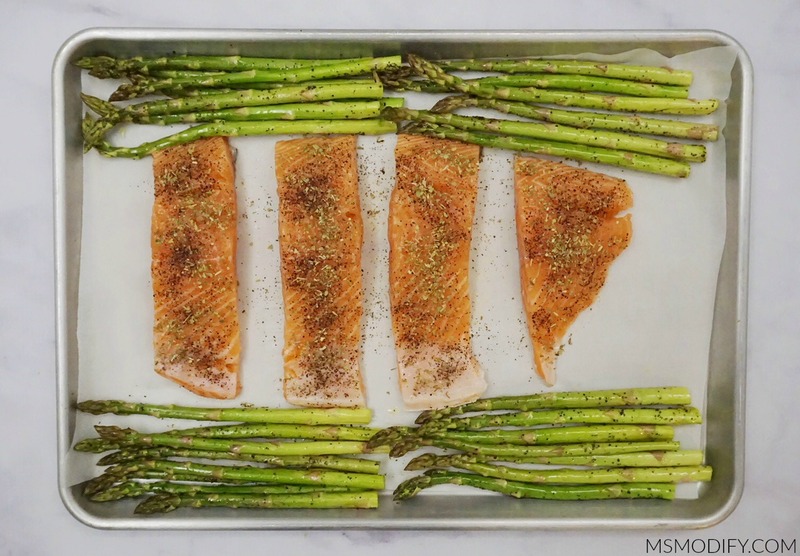 Arrange asparagus around the salmon. Drizzle olive oil, salt and pepper onto asparagus. Bake 13-15 minutes, or until salmon flakes easily with a fork and asparagus is tender. Remove from oven and top each salmon fillet with bruschetta. 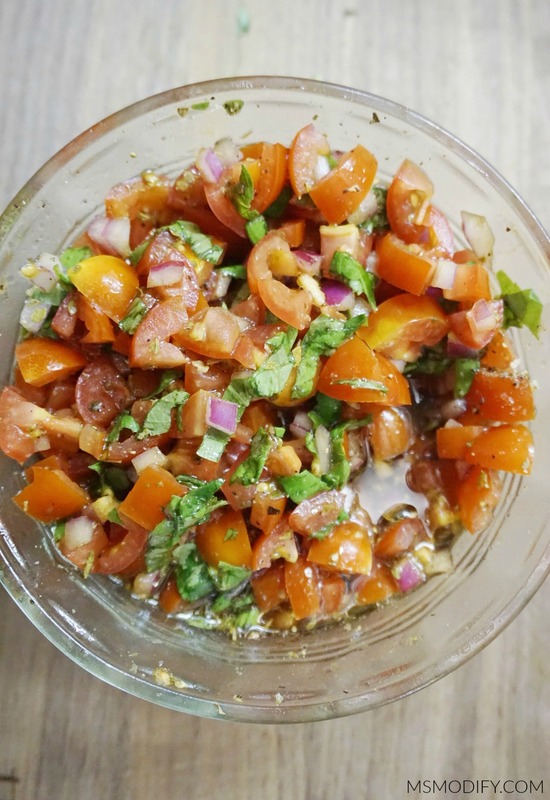 I always serve this with a salad and if I have leftover bruschetta, I toss it in the salad! This entry was posted in Recipes/Dining Out and tagged dinner, one-pan, salmon.